Sparrow & Crowe #2 reviewed at Newsarama.com! 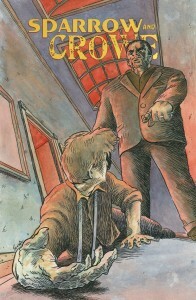 The second issue of Sparrow & Crowe: The Demoniac of Los Angeles was reviewed by Jake Baumgart of Newsarama.com. 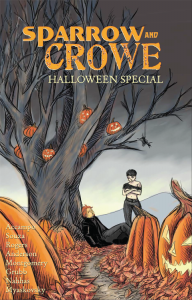 The Sparrow & Crowe Halloween Special is here! Just in time for Halloween, we’ve launched a bold new digital exclusive — our first annual Sparrow & Crowe Halloween Special! We’ve gathered up some very cool talent to present to you these Autumn tales, which range in tone from melancholy noir to comedic romp. 47 pages of content for just $1.99! Available NOW on Comixology.com! What are you waiting for? Click the above link or the photo, and download your copy now! For more information on the stories within, you can also visit our Halloween Special page. Kristine Chester, a contributing writer for Fanboycomics.net, interviewed David Accampo about the imminent release of SPARROW & CROWE, as well as its connection to Wormwood: A Serialized Mystery, and some of David’s other podcasts, including The Deceptionists and Fuzzy Typewriter. KC: You also co-host on a number of podcasts including The Fuzzy Typewriter and The Deceptionists where you dispense invaluable writing advice. For the aspiring comic creators in our audience, is there any advice you’d care to share? DA: I love chatting with the Deceptionists about various writing topics, but I hesitate to call it advice. I feel more like we’re sharing experiences and asking questions of one another. So, I feel like my advice would be to take your craft seriously and learn from everyone. There’s a Zen Buddhism concept called “Beginner’s Mind” which I feel is incredibly useful to writers. It just means that you have to keep yourself open – treat everything as a potential learning experience. When you do that, you’re open to learn from EVERYWHERE. And, I think that’s valuable, because the writing “opinions” I’ve formed over the years have come from so many different sources. Reading comics scripts, creative writing teachers, editors, director commentary tracks on DVDs, books on writing, interviews with writers, your peers. And, most importantly: the act of writing itself. You can and should be learning from everything. And, that’s something that Paul Montgomery and I also share in our sensibility with the Fuzzy Typewriter podcast – we both genuinely love stories and storytelling, and no matter what we’re talking about, I think we both are trying to examine the art and also crack it open a little to see what makes it tick. 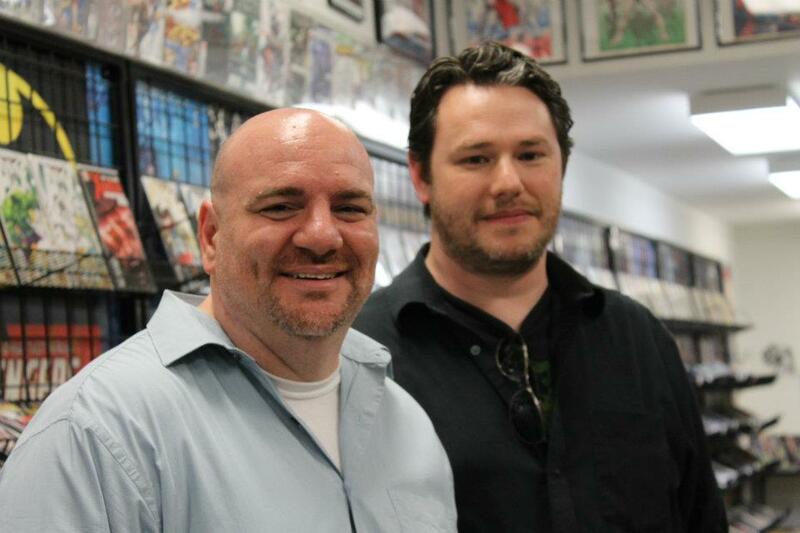 Sparrow & Crowe on Comic Impact! Dave talks a little of the origins of Sparrow & Crowe, the audio series Wormwood, and the Kickstarter campaign. The interview starts at about 13:35, but Simon and Sheldon host a great show, so go watch the whole thing! 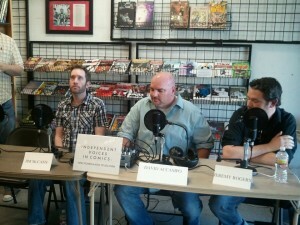 iFanboy has posted the audio of our “Independent Voices in Comics” panel at Earth-2 Comics in Northridge! Click here to listen to the audio, or download from iTunes. 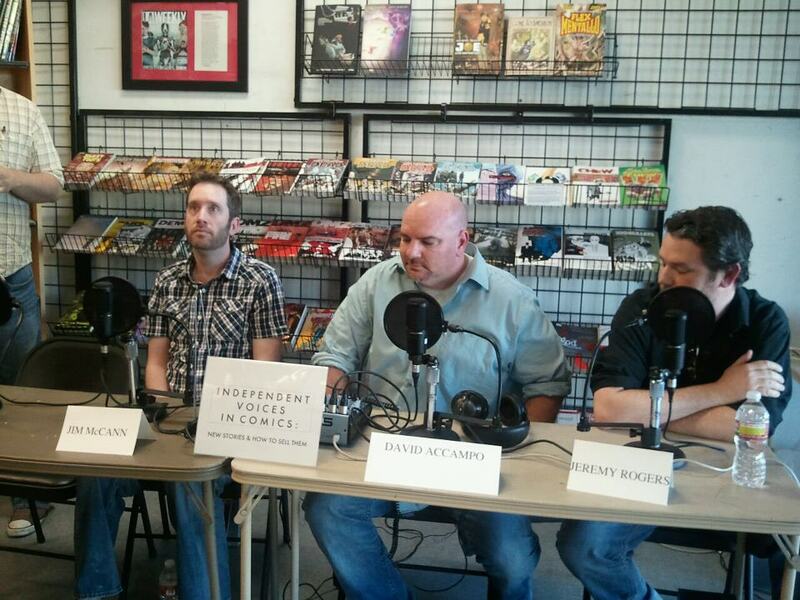 This past Monday, Earth-2 Comics in Northridge, CA hosted “Independent Voices in Comics: New Stories and How To Sell Them”, a panel discussion about the current state of independent comics, moderated by Conor Kilpatrick of iFanboy. We’ve got several new pieces up at iFanboy.com this week about Sparrow & Crowe, including a preview of new art and an informative interview about what to expect from the series. iF: Jared, what attracted you to these characters and their world? As a fan of the audio series, what aspects of Wormwood were you excited to explore visually? iFanboy: Who is Dr. Xander Crowe? What kind of doctor is he? David Accampo: Doctor Xander Crowe was once a renowned psychologist, the kind with a lot of letters after his name. He wrote a lot of bestsellers and maybe even did a failed talk show along the way. He was thought of as a person who understood the human mind better than anyone of his generation. And then he met a little girl possessed by an Evil that didn’t map at all to his understanding of the human psyche. Bad things happened. And it shattered Crowe. When we pick up our story, he’s a washed-up exorcist, scrapping together a living in Los Angeles performing seances and exorcisms. Fanboy Comics Reviews Sparrow & Crowe #1! Kristine Chester has a new early review of Sparrow & Crowe #1 up at Fanboy Comics. Accampo and Rogers did a great job pacing this first issue. They waste no time getting to the action and manage to convey a lot of backstory and characterization along the way. No big monologue is necessary to explain who Crowe is; his actions convey his characteristics. Artist Jared Souza complements the writing with his art’s cinematic feel. There is a lot of detail in his artwork, which lends a gritty, lived in feel to the world. Souza even switches the angles of the “camera” frequently, using perspective to enhance each scene. We’re happy to announce that we’re part of a very special live Q&A panel discussion in Los Angeles. 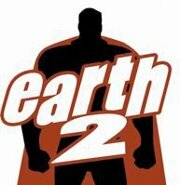 At this live, in-store event at Earth-2 Comics in Northridge, CA, we’re going to discuss the challenges of producing comics outside the mainstream while finding and nurturing an audience in a world of social media, digital distribution and specialty stores. Join us for what’s sure to be a lively discussion and audience Q&A as we talk about the entire comics publishing process, from initial creation to final sale at the register! The full details of the event are on Facebook. David Accampo had the fortune to write a guest column for the Do Some Damage blog. He writes about the intersection of crime and horror, and how they come together in SPARROW & CROWE. My new comic book series, Sparrow & Crowe, co-written with Jeremy Rogers and illustrated by Jared Souza, is a mash-up of crime and horror. And it’s not unique in that category; the two get squished together quite often. But as I’ve lived with this book, which I’ve described as “Chinatown meets The Exorcist,” I’ve put a lot of thought into the meaning of both the crime and the horror in the set-up. Early Review of Sparrow & Crowe #1 at Do Some Damage! Over at the Do Some Damage crime blog, novelist Jay Stringer has posted an early review of Sparrow & Crowe #1. It’s a very thoughtful examination of the first issue, and we’re very excited to be featured on a blog with numerous talented crime writers. The script smartly avoids a lot of the pitfalls that can hamstring new comic writers. Often in a writers early work you’ll see too many words on the page, and an inability to get out of the way of the artist. But the writers, Dave Accampo and Jeremy Rogers have recognised this, and the writing is kept tight and sparse, allowing the scenes to flow. There’s a level of craft here that’s way ahead of where these guys should be, playing with structure enough to fit in a few neat jokes that wouldn’t be possible without a strong understanding of how a comic page works. Souza’s style bears more of a European -almost Tin Tin- looseness, which draws a clear line between itself and the cleaner house styles of bog companies like Marvel and DC. It’s clear and to the point, and it keeps you moving from panel to panel. The finest example of this is the final two pages of the issue, where the scripting, layout and art all combine to perfectly set up and reveal the hook ending. As with the writing, I can’t wait to see where Souza’s art changes as the series progresses. You can read the full review here. Jay’s His first novel, Old Gold, is due from Thomas & Mercer in 2012, and blogs every Thursday at Do Some Damage. You can also catch him at Twitter. Caught between Hell and the mob, Doctor Xander Crowe and his partner Sparrow must face Crowe's biggest failure... and worst enemy. Sparrow & Crowe: The Demoniac of Los Angeles is an original comics miniseries by David Accampo, Jeremy Rogers and Jared Souza. 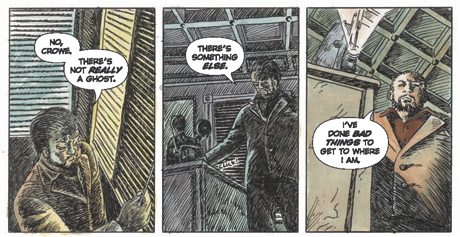 Want to read the Sparrow & Crowe Graphic Novel?